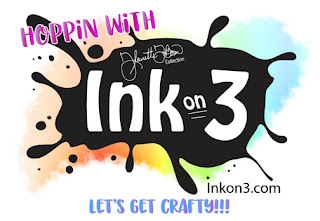 Hey crafty friends, Cheryl here today for a post for InkOn3. I made a fun tag good for any reason. I made a thank you tag. You could tie it on a goodie bag or attach it to a card base. Tags are so fun and good for any occasion. I pulled out a pocket die I have in my stash from My Creative Time. It's such a fun pocket and the tags fit perfectly. I cut it first from white heavy weight cardstock and then from some lighter weight patterned paper from Lawn Fawn. I then glued it to the white base. I then stamped my image onto patterned paper and white heat embossed using Juicy embossing ink and Arctic White embossing powder from InkOn3. I then used the coordinating dies and cut out one of the florals and the little butterflies. For the tag, I first die cut it and then stamped and embossed. For the tag, I first die cut it and then stamped and embossed. Again using Juicy ink and Arctic White embossing powder. I layered the top layer onto the bottom one and then added the reinforcement circle. I also cut one in plain white paper and attached to the back for a place to write your note. I stamped a thank you sentiment and embossed it as well. So that's it. Super easy but super cute and can be made for any occasion or holiday. The sky is the limit on something like this. So that's it. Get out your supplies and craft up your own designs. I hope that this gives you a few ideas! Hello my Friends, Ilda here from ilovedoingallthingscrafty.com! I am back from vacation and finally had a chance to play with the new Ultra Fine Embossing Powders from Ink On 3. I am completely in love with how these powders melt, they are AH-Mazing! 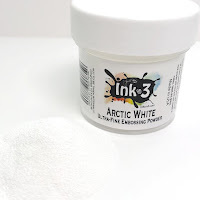 If you like using Embossing Powders I'm sure you will LOVE these! I used the Juicy Ink pad to stamp the Hollyhocks onto a piece of watercolor paper. I then sprinkled Gold Rush Ultra Fine Embossing Powder onto the stamped images and melted the powder with a heat gun. Next, I colored in the images with Migello Mission Gold Watercolors. Once the panel was all colored and dry I trimmed the edges to fit onto an A2 card front. I then inked the edges of the panel with Juicy Ink and then embossed them with the Gold Rush Powder. For the sentiment, I used the standalone die from the Dogwood flower die set and embossed it with a couple of coats of Gold Rush Embossing Powder. 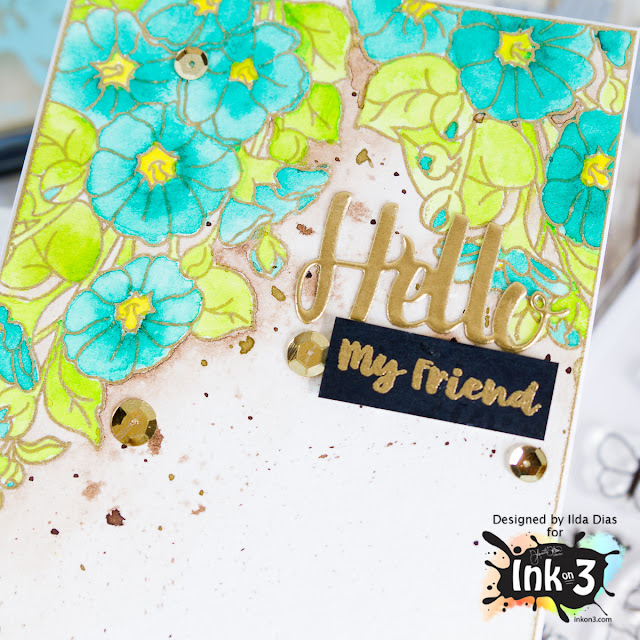 I also stamped out the "my friend" from the Hollyhocks set using Juicy Ink onto a piece of black cardstock that then once again embossed with Gold Rush. Hope you were inspired by this friendship card today. For more inspiration using the NEW Ultrafine Embossing Powders, check out the previous post on this Blog. Watercolor and Embossing Techniques, using the stamp set "My Little Catfish"
I had so much fun making this card as it is one of my favorite stamp sets. It always brings back sweet childhood memories for me. When I was a little girl about 8 years old, I got my first pet cat and I named her Catfish. Why Catfish? Well, I had a big love for all creatures of the sea and lakes I guess, lol. She turned out to be my very best friend growing up and I had her all the way though college. So every time I use this set, a little piece of her comes back to life. 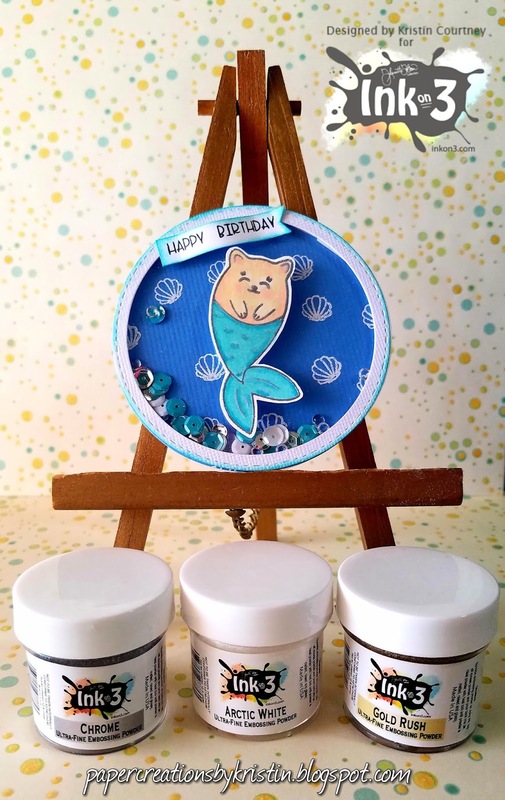 I hope you will get as much joy out of creating with this little mercat set as I do, after all who doesn't like mermaids and their pets of course. Here is quick video showing the watercolor and embossing techniques I used to create this card. 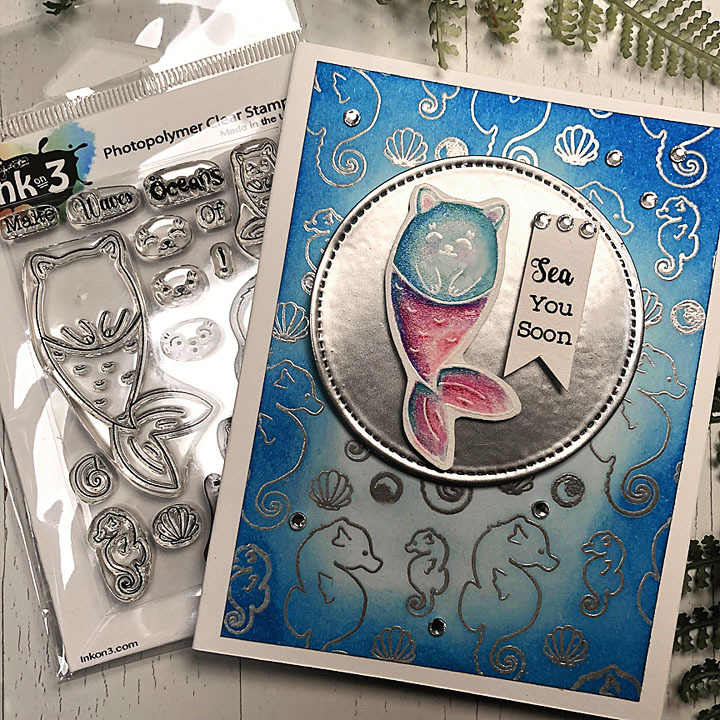 First I used the seahorses and sea shells and Chrome Ultra-Fine Embossing Powders to create a fun background. Then ink blended the blue over the top to give it that deep blue sea feel. For the Mercat or "Catfish" lol, I embossed it in the Arctic White Ultra-Fine Embossing powder then used watercolors to color it in. To add some deeper tones I accented it with some colored pencils. Lastly, I created a banner tag and stamped the sentiments Sea You Soon, with the Blackout Waterproof Detail ink. I have created a fairy / flower watercolored, embossed card combining two stamps sets ~ Fairy Wishes & Hollyhocks and oh what fun it was, plus I think you will be amazed at how smooth and detailed the gold embossing powder is on the fairy (it's a super detailed image)! I used two of the Ultra-Fine Embossing Powders, along with the coordinating die set from Holly hocks. You can see all the shine and fine detail in this video. Scroll down to see how I created this and then scroll down a little farther for your next stop on the hop! Oh and remember to leave a comment on each blog post to be entered to WIN a $25.00 Ink On 3 Shopping Spree! One winner will be chosen after August 19th. Giveaway will close on August 19th at noon CST, Winner will be posted on the Ink On 3 blog. I embossed the Hollyhocks stamp with the Arctic White Ultra-Fine embossing powder on Fabriano 100% cotton watercolor paper and water colored it with Kuretake watercolor paint. 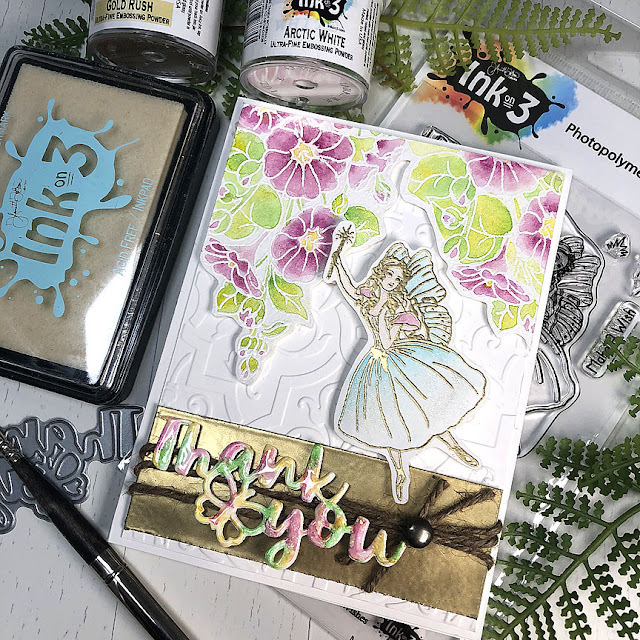 I embossed the fairy from the Fairy Wishes stamp set on Neenah White card stock, using the Juicy Embossing Detail ink along with the Gold Rush Ultra-Fine embossing powder. Then lightly watercolored it with the same watercolor paint as above. Next I did something really cool and fun! I die cut the "Thank You" using the stand alone word die from the Hollyhocks Coordinating die set, embossed it with Juicy embossing ink and poured on the Arctic White powder, after heating it, I poured more on while it was still hot, than did that one more time to get it super thick. After it was cool, I took some Copic markers and randomly colored the letters, then heated it up again (which will move and blend the colors) then to get the colors brighter, I colored them again, as when you melt it it will lighted from mixing with the white. Then I heat it up to blend the colors again. It gives a really pretty, shiny effect. I just love it!!! For the gold background of my sentiment, I just cut a piece of card stock, inked it up with the Juicy Embossing ink and poured the Gold Rush powder on top and heat it up, I did it twice to make it extra thick. I think it turned out great and looks like metal in real life! *I will be doing a Youtube and Facebook lives to show how I created this. Thanks so much for popping in and have a blast on the rest of the hop! 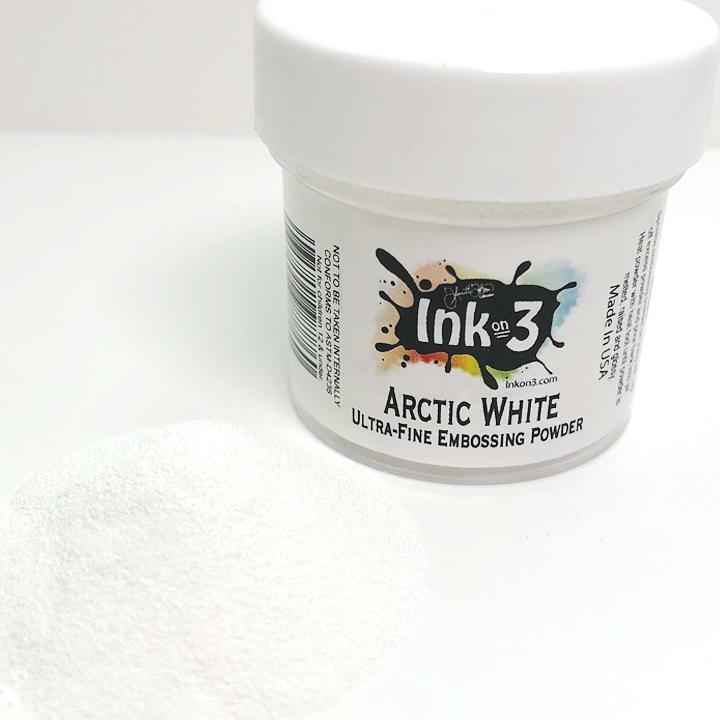 Welcome to Ink On 3's monthly blog hop where we are featuring the NEW Ultra Fine Embossing Powders now available! You will absolutely love these ~ they come in Arctic White, Chrome and Gold Rush. There are great projects along the way and also an awesome prize to be won! Here is my round shaker card I made embossing with the Chrome and Arctic White powders. It is hard to get a great picture showing how bright the white is and how shiny the chrome is! Also, the texture is super smooth and fine. The stamp sets I used are My Little Catfish and the sentiment is from Dogwood Flower. I stamped the background using the little seashell with the amazing Juicy Clear Embossing Ink and embossed with the Arctic White powder. The catfish is embossed with the Chrome powder. The catfish is on an action wobble, so it moves and looks like it is swimming" in the ocean. Grab all 3 Ultra-Fine Powders and save 20% This week only, use coupon code ~ bosshop20 ~ You will save 20% on all new powders and our inks! Here is the lineup: Have fun hopping! Comment on each blog post and be entered to win (1) $25 Ink on 3 shopping spree! Giveaway will close on August 19th at noon CST and the winner will be posted on the Ink on 3 blog! Hey Crafter! Let's hop, shall we? Today is a new exciting product release! EMBOSSING POWDERS!!! Yep, that's right. And they are amazing! Super fine, no added waxes or fillers, and they melt amazing! Let me show you what I did using the Chrome. I used the Dogwood Flower stamp set to create a frame around a 4 x 4 piece of cardstock. I stamped using the Juicy ink and added the Chrome embossing powder and melted it. This is a fabulous silver! It is so shiny and you have got to see it in person. Photos and descriptions don't do it justice. I also created a matching envelope using the Envelope Punch Board from We Are Memory Keepers. The directions are on the board for the size envelope you wanna make. I then die cut a label using a die from my Spellbinders stash. I stamped the sentiment and embossed again using the Chrome. I cut a second label from silver glitter paper, cut it in half, and attached it so the two ends show the glitter. I attached the 4 inch square panel to a 4.25 x 4.25 card base using foam tape. I then added the label, also with foam tape. I tried my best to capture the shine. This shows a bit. It's hard on white but I wanted this to look really clean. I added a few crystal gems to the front and I brushed my Spectrum Noir sparkle brush into all the flowers. The sparkle is amazing! You gotta try this powder so you can see for yourself! Comment on each blog post to be entered to win one $25 InkOn3 shopping spree! 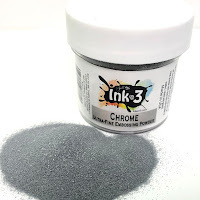 Giveaway will close on August 19th at noon CST and winners will be posted on the InkOn3 blog! Grab all three Ultra-Fine powders and save 20%. This week only! Use coupon code bosshop20. 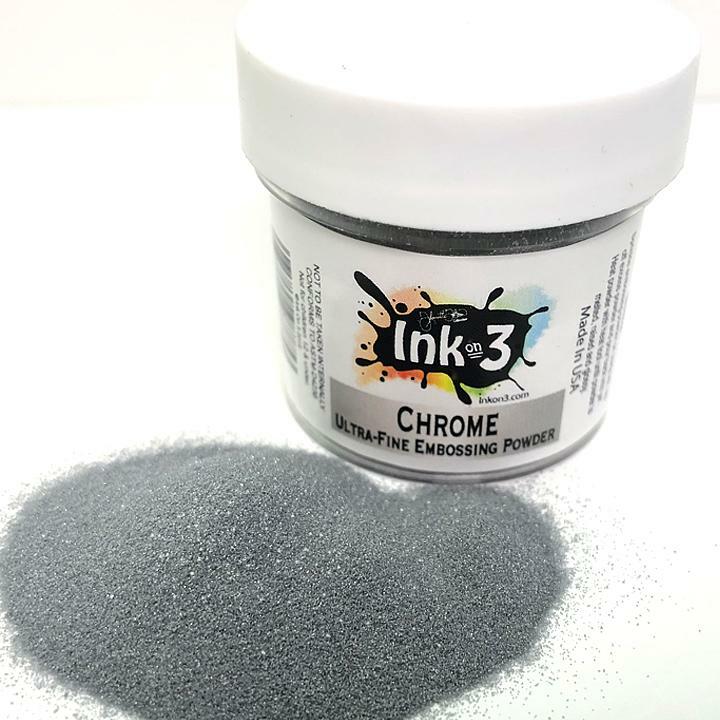 You will save 20@ on all new powders and our inks! Here's where you can get the products used in this project and so much more! Have fun hopping and get your craft on! Hey everyone! Kelli here sharing another preview of the embossing powders that will come out tomorrow! These are by far the best embossing powders I have used yet. They melt so beautiful and are really fine! Great for detailed images. For this card I used the Dogwood Flowers stamp set that was released last month. I watercolored these flowers up real quick and I love the way they turned out! Hi Cheryl here and today we are showcasing a brand new product from InkOn3!!! How exciting is that??? Any guesses? Yes, and they're amazing, too. This is amazing powder. It's milled to ultra fine and no added waxes or fillers. It is the finest I've used! You are gonna love it! So, here's what I did using the Arctic White and the Gold Rush powders. I have some widow sheets that you can emboss on. So I used my anti static powder very liberally!!! I then stamped my image with Juicy ink and poured on the Artic White powder. And then used my heat tool to melt it. Keep your tool moving or the acetate will warp. Then I choose to use a white woodgrain paper for my card front. I used the coordinating die for the floral stamp and cut it in the center of the card front. Next, I aligned the embossed acetate so it fit right in. I had already added double sided tape to the back of the card front so it would stick right in place. I then used a double layer of foam tape all around the window to fill with sequins. I wanted to totally fill the space so that all you would see is the sequins making the color of the flower. I chose shades of purples. I then closed up the back with some purple cardstock to carry on that color. I cut a strip of vellum and stamped the sentiment after prepping with my anti static powder. 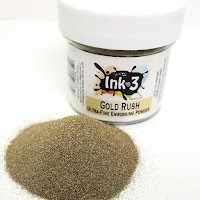 I poured on the Gold Rush embossing powder and melted with my heat tool. I backed it with the same purple cardstock and wrapped the edges behind the card front. I finished off with a few sequins and attached the card front to an A2 card base of heavyweight white cardstock. So, there you have it. This embossing powder is fantastic and I know you will love it. It melts so smooth! And the white is VERY white! And the Chrome??? Well, it's my favorite! Head on over and check out the store. Fleurette has such cute stuff. And the inks are great! And you will love these new powders. 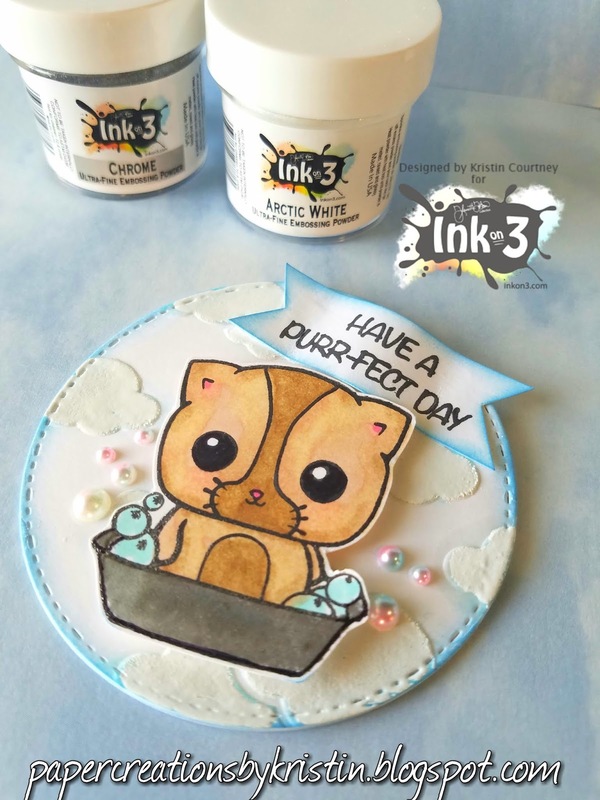 Round Kitty Card- NEW embossing powders from Ink On 3! Hello! Today I am sharing a card I made using the NEW Ultra Fine Embossing Powders and Juicy Embossing /Watermark Re-inker from Ink On 3! The powders are amazing, ultra fine and melt amazing! The background clouds are made using an embossing folder first. Then I took a small paintbrush and using the Juicy reinker, I "painted" the clouds then sprinkled the Artic White embossing powder over them. They came out so shiny and smooth looking! I did the same thing with the tub that the kitty is sitting in using the Chrome embossing powder. Stamp Set also from Ink On 3. The round card is made using a die cut from my stash.